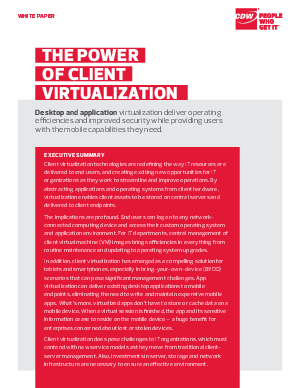 Client virtualization technologies are redefining the way IT resources are delivered to end users, and creating exciting new opportunities for IT organizations as they work to streamline and improve operations. By abstracting applications and operating systems from client hardware, virtualization enables client assets to be stored on central servers and delivered to client endpoints. The implications are profound. End users can log on to any network connected computing device and access their custom operating system and application environment. For IT departments, central management of client virtual machine (VM) images brings efficiencies in everything from routine maintenance and updating to operating system upgrades.